At Tango Hair Loss Clinic in Brisbane we offer four different solutions to women suffering hair loss. So whether you’re just experiencing the start of female pattern baldness or close to losing all your hair we’ve got the right solution for you. To regain your lost confidence and discuss which solution best suits your needs call us on (07) 3366 1388 to arrange your FREE consultation in one of our private rooms. Because women regard their hair as a reflection of their personality and style (not to mention just helping them look their best), hair loss in women can be an extremely devastating condition. And while most people think of hair loss as mainly a male problem, research has shown that forty percent of those suffering from temporary or long term hair loss are actually women. Female hair loss can be as little as thinning hair or centre partings, gradually widening through to distinct patches of baldness especially near the crown of the head. Just what is normal hair loss in women? Most women are aware of those annoying hairs tangled in their brush or comb. But how do you know if this is actually normal hair loss in women or the onset of a bigger problem? The average head contains roughly 100,000 hairs and each hair follicle produces a strand of hair growth approximately one centimetre each month. However, the hair growth cycle is a strange beast. After growing for six years it suddenly stops before falling out and being replaced with a new hair. At any time, 85 percent of your hair is growing while the remainder is in a resting phase. It is normal to shed between fifty to one hundred hairs each day and this explains why it is normal to find some loose hairs on your clothing or in your hairbrush. 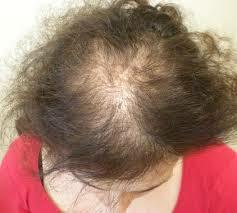 However, abnormal hair loss in women is noticeable when clumps start falling out when you wash or style your hair. 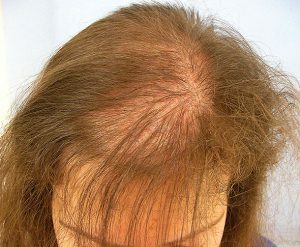 Alternatively, you may simply notice that your hair is thinning gradually over time. This can be the result of a number of potential triggers. Perhaps the most common trigger of hair loss in women is when the thyroid gland starts misbehaving. Located at the front of your neck, this tiny gland is responsible for producing a number of hormones to regulate vital body functions. However, if your thyroid is producing too little or too much hormone, your hair growth cycle could be affected. Polycystic Ovary Syndrome is a chronic imbalance in hormone levels. This is caused when your body produces higher levels of hormones. The tell-tale sign of this imbalance is extra body hair growth while the hair on the scalp becomes thinner. This condition can also trigger weight gain, ovulation issues and acne. But thinning hair is the most obvious symptom. 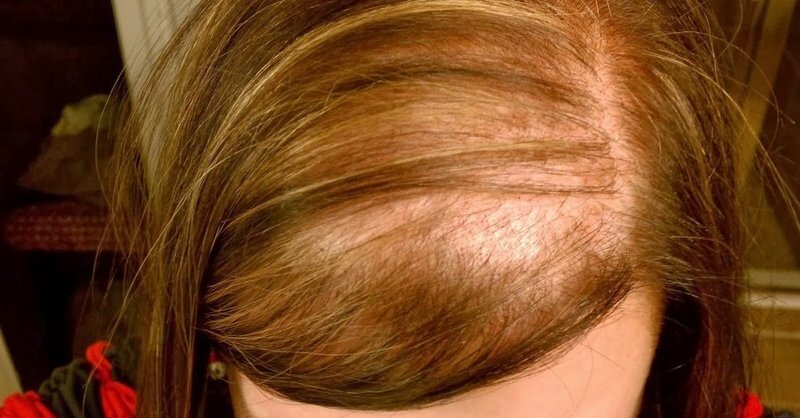 This type of hair loss in women usually sees missing hair growing back in about a year.But in some cases, hair loss on both the scalp and body may be permanent. The high hormone levels during pregnancy often keep scalp hair in a resting cycle. The result is your hair no longer falls out and gives the appearance of being fuller (a condition most pregnant women secretly wish was permanent). However, after you have given birth and your hormone levels begin to settle, the resting hairs tend to normalise and actually start to fall out very quickly. This will appear to be a startling amount of hair loss so don’t despair … things will return to normal in about two years. One of the little known possible side effects of taking certain medications is hair loss in women. This happens a great deal with certain types of birth control pills. It’s mainly because the hormones in the pill set off a suppression of ovulation and thinning hair starts up. You may also experience hair loss when you stop taking your birth control pills… but this is more common in women with a family history of female hair loss. If you have undergone a crash diet and lost more than seven or eight kilograms, you may notice that you suffer from hair loss for about three to six months. This is especially common in very restrictive diet plans which limit protein or are very high in vitamin A.
Fortunately, normal hair growth is likely to resume once you return to a healthy balanced diet. There’s no doubt that female hair loss can be a very upsetting condition. But once the underlying cause is established, its treatment becomes easier to diagnose. If you are concerned about your hair loss, it’s important that you consult a hair loss specialist to determine if you do have any underlying causes and ensure that they are corrected to restore the health and thickness to your hair. Here at the Tango Hair Loss Clinic, we (Tiffany and Rosalie) understand the upsetting nature of female hair problems. They have devoted their professional lives to find and offer help to local Brisbane women. We suggest you give us a call on (07) 33 661388 and book in a FREE consultation in one of their private rooms. That way you can discuss and discover just what treatment is available to help you. Remember, hair loss in women is no longer the painful journey you have to travel alone.